A boy has died following a blaze at a bungalow in Essex. 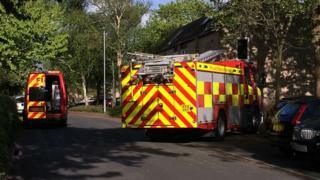 The fire broke out at the property on Beambridge Road, Pitsea, Basildon, at 15:15 BST on Monday. Two brothers, aged 10 and 13, were taken to hospital with what were described as life-threatening injuries. Essex Police confirmed the 10-year-old died on Thursday night. The older boy remains in hospital in a critical but stable condition. The cause of the fire was accidental. Both boys had to be rescued after becoming trapped in the property. They were taken to a local hospital and later transferred to Great Ormond Street Hospital in London. The boy who died has not yet been formally named by police.